, a learned English divine, was born Oct. 18, 1608, at Yeatenton in Devonshire. He was educated in classical learning at private schools, and, in 3626, sent to Exeter college in Oxford. 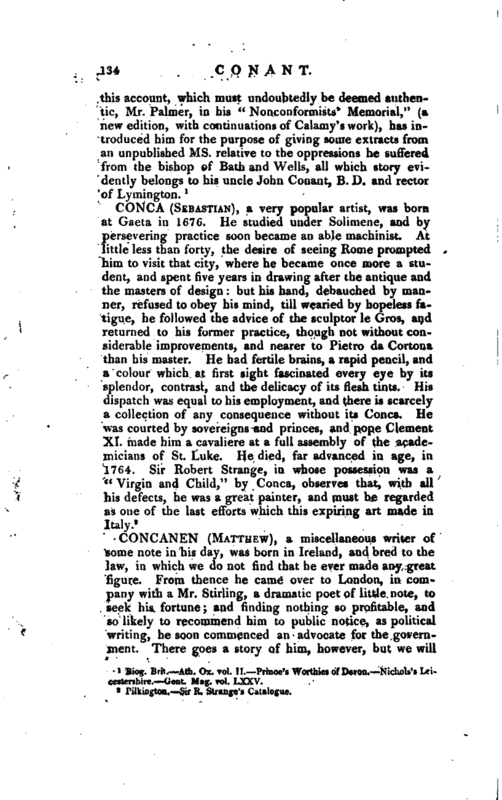 He soon distinguished himself for uncommon parts and learning*; by means of which he grew highly in favour with Dr. John Prideaux, then rector of Exeter college, and king’s professor in divinity, who, accordingto the fashion of wit in those times, used to say of him, “Conanti nihil est difficile.” He took his degrees regularly; and, July 1633, was chosen fellow of his college, in which he became an | eminent tutor. Upon the breaking out of the civil war, he judged it convenient to leave the university in 1642. He retired first to Lymington, a living of his uncle’s in Somersetshire; where, his uncle being fled, and he in orders, he officiated as long as he could continue there with safety. While he was at Lymington, he was constituted by the parliament one of the assembly of divines; bnt it is said that he never sat among them, or at least very seldom, since it is certain that he never took the covenant. He afterwards followed his uncle to London, and for some time assisted him in the church of St. Botolph Aldgate. He then became a domestic chaplain to lord Chandos, in whose family he lived at Harefield. He is said to have sought this situation, for the sake of keeping himself as clear from all engagements and difficulties as the nature and fickle condition of those times would permit. Upon the same motive he resigned his fellowship of Exeter college, Sept. 27, 1647; but, June 7, 1649, was unanimously chosen rector of it by the fellows, without any application of his own; and. Wood allows that under his care it flourished more than any other college. This difficulty being got over, he went on to discharge his office of rector of P^xeter college with great approbation. In 1652 he received priest’s orders at Salisbury, and, in Dec. 1654, became divinity- professor of the university of Oxford. In 1657 he accepted the impropriate rectory of Abergely near St. Asaph in Denbighshire, as some satisfaction for the benefices formerly annexed to the divinity chair, which he never enjoyed; but knowing it to have belonged to the bishopric of St. Asaph, he immediately quitted it, upon the re-establishment of episcopacy. Oct. 19, 1657, he was admitted vice-chancellor of the university; which high dignity he held till August 5, 1660. 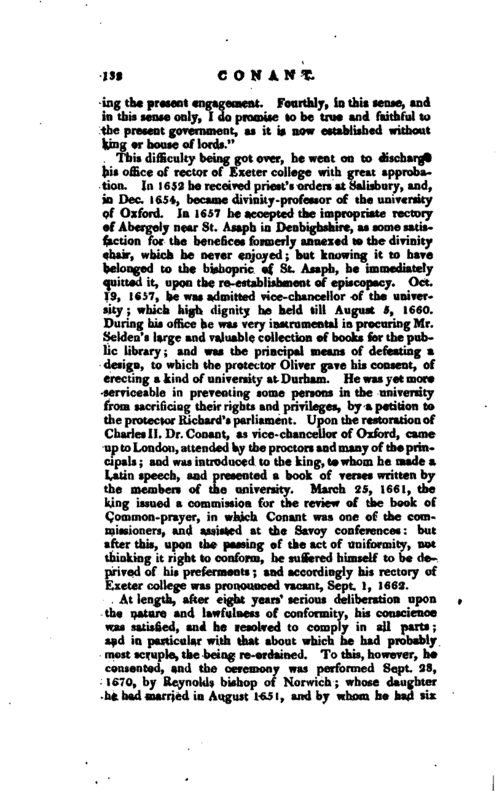 During his office he was very instrumental in procuring Mr. Selden’s large and valuable collection of books for the public library; and was the principal means of defeating a design, to which the protector Oliver gave his consent, of erecting a kind of university at Durham. He was yet more serviceable in preventing some persons in the university from sacrificing their rights and privileges, by a petition to the protector Richard’s parliament. Upon the restoration of Charles II. Dr. Conant, as vice-chancellor of Oxford, came up to London, attended by the proctors and many of the principals; and was introduced to the king, to whom he made a Latin speech, and presented a book of verses written by the members of the university. 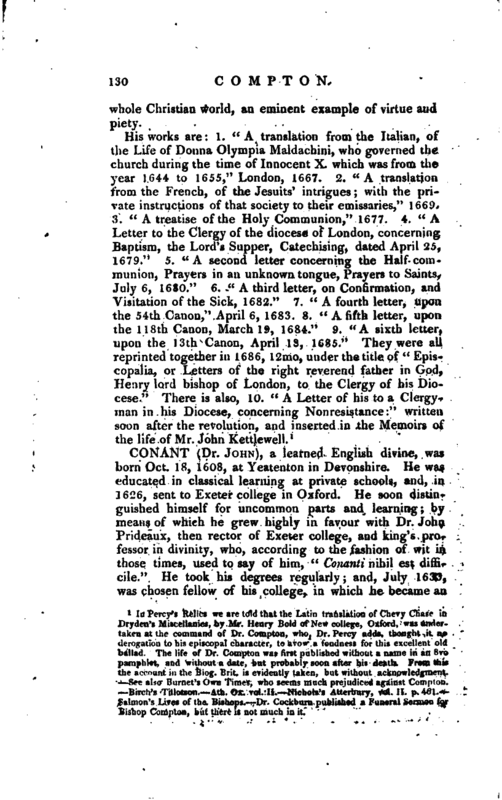 March 25, 1661, the king issued a commission for the review of the book of Common-prayer, in which Conant was one of the commissioners, and assisted at the Savoy conferences: but after this, upon the passing of the act of uniformity, not thinking it right to conform, he suffered himself to be deprived of his preferments; and accordingly his rectory of Exeter college was pronounced vacant, Sept. 1, 1662. At length, after eight years 1 serious deliberation upon the nature and lawfulness of conformity, his conscience was satisfied, and he resolved to comply in all parts; and in particular with that about which he had probably most scruple, the being re-ordained. To this, however, he consented, and the ceremony was performed Sept. 28, 1670, by Reynolds bishop of Norwich; whose daughter he had married in August 1651, and by whom he had six | sons and as many daughters. 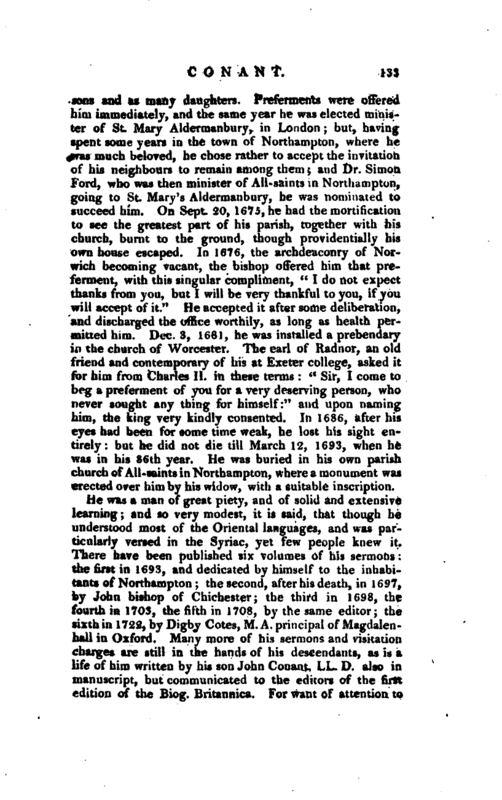 Preferments were offered him immediately, and the same year he was elected minister of St. Mary Aldermanbury, in London; but, having spent some years in the town of Northampton, where he was much beloved, he chose rather to accept the invitation of his neighbours to remain among them; and Dr. Simon Ford, who was then minister of All-saints in Northampton, going to St. Mary’s Aldermanbury, he was nominated to succeed him. On Sept. 20, 1675, he had the mortification to see the greatest part of his parish, together with his church, burnt to the ground, though providentially his own house escaped. In 1676, the archdeaconry of Norwich becoming vacant, the bishop offered him that preferment, with this singular compliment, “I do not expect thanks from you, but I will be very thankful to you, if yon will accept of it.” He accepted it after some deliberation, and discharged the office worthily, as long as health permitted him. Dec. 3, 1681, he was installed a prebendary in the church of Worcester. 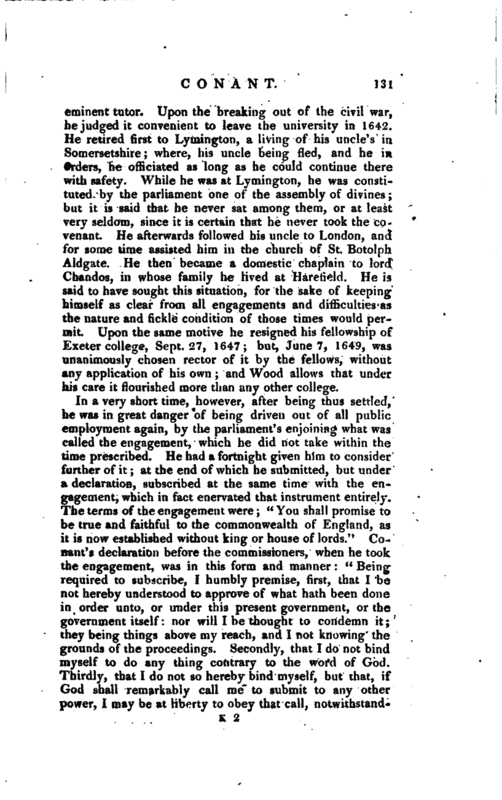 The earl of Radnor, an old friend and contemporary of his at Exeter college, asked it for him from Charles 11. in these terms: “Sir, I come to beg a preferment of you for a very deserving person, who never sought any thing for himself:” and upon naming him, the king very kindly consented. In 1686, after his eyes had been for some time weak, he lost his sight entirely: but he did not die till March 12, 1693, when he was in his 86th year. He was buried in his own parish church of All-saints in Northampton, where a monument was erected over him by his widow, with a suitable inscription. Biog. Bri. —Ath. Ox. vol. II. Prince’s Worthies of Devon. Nichols’s Leicestershire. —Gent. Mag. vol. LXXV.